West Asia is once again at the cross roads of a major conflict, one that has been evaded in the region for at least a decade since Israel withdrew from Southern Lebanon. 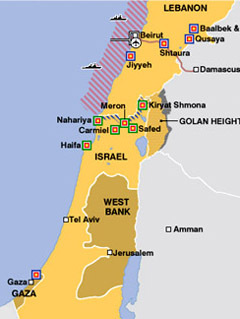 As Israel bombed Beirut airport on 13 July 2006 and simultaneously blockaded the Lebanese ports, all indications are of an Israeli drive into Lebanon to take out the Hezbollah guerrillas ensconced in multiple lairs in and around Southern Beirut. The Israeli spokesman said so in as many words indicating that the blockade will last till the conflict goes on, implying until the Israeli soldiers were released by Hezbollah. The ongoing stand off is apparently a part of the ongoing turf war within the Palestinian community, Iran's quest for dominance in the region, business interests of various players and the Sunni ' Shia conflict within Islam. It is this vortex of multi pronged interests which has dangerous portends for the region with the crisis likely to linger on for many weeks or even months ahead. Its end would also denote a new balance of power in the Middle East, based on Iranian prominence, a tilt which may not favor America. The above premise is based on a number of factors. The first and foremost is emergence of Iran as a primary force in the region based on the bellicose policy of its regime. The slow and steady rise of the Shias in West Asia for the first time in many decades and Iran's growing assertiveness in maintaining its nuclear sovereignty needs to be seen in this light. The significant factor relevant to the current crisis is Iranian support of the Hezbollah which has bolstered its strength as well as image. Hezbollah apart from its terror network has considerable rocket power to cause destruction on Israeli strategic targets and has seized the opportunity opened by the military wing of Hamas led by Khaled Meshaal in kidnapping an Israeli soldier, Corporal Gilad Shalit by going one up and capturing two Israeli soldiers in a fire fight. This has had a, 'strategic corporal' effect on the militarized Israeli society, which has been shocked into action as it views its military superiority and credibility in the region at stake. A rabid national reaction from Israel was more than expected. At this juncture it is not clear if Hezbollah had anticipated the same and is playing for enlarging the conflict or has badly miscalculated. In the former case it would have done so at the behest of Iran and will see the stand off blowing into a full fledged war engulfing Israel, Syria, Lebanon and Palestine. In case it has miscalculated, there is a scope for negotiations if the saner players in the region, Jordan and Egypt backed by Russia and the European Union quickly step in. Syria is also a decisive player; it has considerable leverages to simmer down the looming conflict. Iran however holds most of the cards. Iran today is on a roll, firmly entrenched in Iraq and now with a hand in the Palestine ' Israeli imbroglio; it can prevent a conflictual show down in Lebanon. The emergence of moderate Palestine leadership is also likely to suffer a blow if the kidnapping crisis does not blow over. In the continuing power struggle within ruling Hamas, an increase in influence of the militant Meshaal group will be a blow to the moderates in the ruling regime. Israeli capitulation over Corporal Shalit or the soldiers kidnapped by Hezbollah would provide these groups the impetus to capture the fundamentalist space within the current power struggle in the Islamic diaspora in the Middle East torn between a Shia ' Sunni, Arab- non Arab and a moderate ' fundamentalist divide. The people of Lebanon are paying the price for the ineptitude of their government from being a sanctuary for fundamentalists as the Hezbollah despite considerable support from Western governments. This is indicated by the virtual go ahead for Israeli invasion of Lebanon by President Bush as far as it does not destabilize the government in Beirut. Now that the battle lines are drawn, the end game needs to be seen in perspective. All depends now on what is Iran playing for. If it is seeking a hegemonic role in the region, than the turmoil will continue in the days ahead. If it is indulging in brinkmanship then it is more than likely that the Hezbollah may back off after negotiations. There will be considerable consternation in case Iran emerges as a predominant power in the region which has been deliberately nurtured as a power vacuum by America over the years to enable it to have a controlling influence. This may lead to greater involvement of the entire G 8 club, with Russia, France and Germany having their own interests in the region. The immediate impact will be on the oil economy, the speculators in Nymex and London Brent Crude now have a golden opportunity to talk up the prices of the back gold.